Once upon a time, I was a little girl, and my room was this one area of the home that belonged to me. Like all toddlers, I spend a tremendous amount of time improving the wallpaper with a bunch of crayons and the fierce determination to rival Jackson Pollock. A drive my parents never quite understood until I started pasting bits of paper and doodled with lipsticks (I had no choice, they confiscated all the legit art supplies). As I grew up, I went from being a typical messy kid, who ended up sharing my room with my little sister for a while. When I was 10, the time to move out of the kids bedroom came, because not only did I have a later bedtime, I also started to really clash over the mess in our room. My sister was a messy and happy to remain so girl while I suddenly started really taking care of my space, and my belongings. Fortunately, our flat had a spare room that my parents turned into a Study, complete with a book shelf, and armchair. That room was about half the size of the one I shared with my sister, but I was really really happy to have my own space. The only problem of that room was that it was the poster child of 70's home decor and 30 years after first moving in, I am still fairly traumatised by my parent's style choice. The room had a bright wall to wall orange carpet, and a zig zag pattern wallpaper in various shade of avocado green. If it wasn't horrible enough, it was paired with printed linen curtains that had a tropical green leaf pattern on off white. Because clashing leafy prints with zig zags all in various shade of greens was not a problem at all when they decorated that room in 1978. I skillfully negotiated with my dad to let me redecorate the space, he refused to do it himself, refused to hire help to do it, and refused to pour lot of money into it. So I told him I would pull the work during my Fall break holiday, and would use my savings to contribute to the cost of material. On those terms, I bought the dispersion paint for the ceiling with my savings, and my dad pitched in to cover the cost of the wallpaper my savings could not. I still remember that discussion about wallpaper because I wanted nothing to do with adding a new paper, and my dad flat out refused to let me sponge paint the walls in my room, since he vetoed my paint idea, and his wallpaper plan ended up being costlier, he agreed to contribute financially. I also still remember the debate at the home improvement store, I wanted a sky blue and white sponge effect textured wallpaper while he was trying to sell me hard on a white one with light small blue stripes on it. I won that battle because my choice of wallpaper was on sale. I remember that Fall break vividly, because I was having Synchronized swimming training 6 hours a day, and would spend my evenings redoing my bedroom. There were a few days of me working with a damp sponge, bucket and a scraper to meticulously remove the avocado nightmare off my wall, then an evening of me painting my ceiling with a fresh paint of white, and finally on the weekend, my dad came to help put my new wallpaper up. This is when a new debate raged. My dad was all for keeping the orange wall to wall carpet, and I kept telling him it clashed with the walls. I knew that the flooring underneath was a standard vitrified wood tile floor that I wanted to have in my room. I won that case with the help of my mom who pointed out I was old enough not to stomp on the floor like an elephant. I spent the Sunday before school reopened ripping that horror of the floor and scrubbing old carpet tape residues off the vitrified floor. This is at this age that I started having an interest in home decor, I ended up pursuing that passion a few years later and turned it into an apprenticeship and career. And since that ripe age of 15, I never stopped making it a priority to have my space look good. Home decor is part of my life, and it is a matter of pride for me to have a home I can relax in. There are many theories and research out there that shows how much the way you keep your home influence your mood, and life. There are even very ancient theories like Feng Shui and Vaastu that support this idea that a home emit a certain vibe and energy. 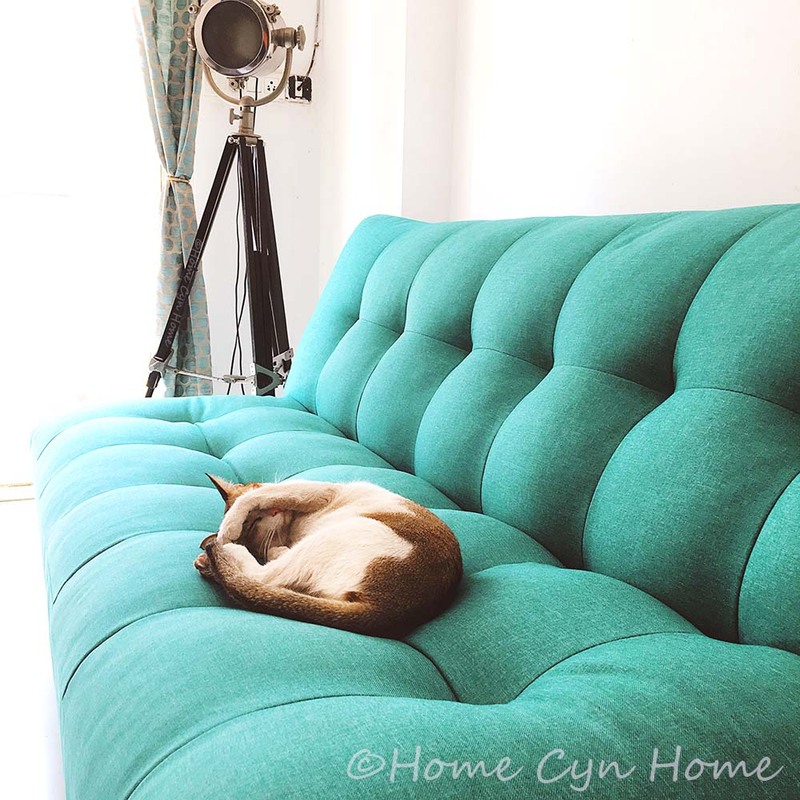 I have made it no secret on this blog that I do believe to Feng Shui to an extent, and while I don't go overboard with zones and what to put in each, I do follow a few principles. My number one rule is no clutter, because clutter disrupt the flow of energy. Have you ever visited someone's home and felt really oppressed or really not at ease? Chances are that the way they decorated their space was not in tune with your personal vibration, or it was downright dated and cluttered. Recently my husband was sharing an experience he had visiting a home where he felt so great he found it hard to leave, it's safe that home had a very good positive energy to which my husband was attuned to. Our home pretty much belong to that category too, we strive to keep it clean, uncluttered, and colourful. I chose blue as the main color across our home because this is a calming soothing color that I am particularly attuned to. Odds have it that it is also a color that goes well with a number of bolder colors and let me display my very colorful artwork effortlessly. I seriously believe that a home is a mirror to our personality, and that it should be treated with the same respect we all should have for ourselves. Think of the Kon-mari method (this is an affiliate link). You may or may not agree with everything that Mari Kondo preaches, but there are some key ideas that make a lot of sense. Keeping the items that "spark joy" and discarding the rest, and making sure that those items you cherish have a designated space to store them in is far from crazy and totally achievable. I'll never be the obsessive clothes folding person, and when something stops feeling nice I discard it without bowing to it or saying thank you to it for serving me for example. But I do make sure my home gets the TLC it deserves on a daily basis. Why? Because I deserve to feel good in my space, and I can only feel good about it if it shares the same vibration frequency as I.
I work from home, so this means that I spend a LOT of time within the same 4 walls, so those walls better work for me and my sanity. Even when I was working outside the home, there was something awesome about stepping into my home after a long day at work and let the space work its relaxing magic on my exhausted mind and body. Seriously, the last thing you want at the end of a long day is come home to piles of clutter on the dinning table, sofa, bed, or coffee table. Chances are all you want to do it kick off your shoes, change into comfy clothes and chill listening to music, or reading a book (or watching TV). If you know your worth, you'll probably throw in a few scented candles, or dim the light to give your home a soothing atmosphere as well, because the lighting in your home is VERY important. The Danes have a word for this cozy warm feeling : Hygge, and if you are not familiar with it, I urge you to read this book : The little book of Hygge by Meik Wiking. A lot of people make the mistake of only really decorating their living room to the extreme, and often, only to impress potential guests. I've seen it a lot over the years, and I think it is sad to decorate a room just to please someone else and then not really enjoy being in said room the rest of the time. Decorate your space, all of it, so that you feel comfortable in it. If you do, you'll anyway radiate a positive happy energy that is very likely to make any potential guests feel at ease. A happy home always impress and work its magic, and it has nothing to do with cold imported marbles, expensive furnitures or gilded accents on the walls. We evolve, and change over the years, and so should our decor. Proof be how my childhood home evolved. My parents moved into that flat in 1978, it was a brand new construction back then, so the builder offered to residents to choose from the sample books of wallpaper and carpet he had. This meant everything was the height of fashion for the 70's, and my early memories were of thick woollen wall to wall carpets in every rooms. The orange from my 10 years old room, the dull mixed grey in my early childhood room, the forest green in the hallway....we even had a carpet runner of orange and yellow design in the kitchen to match the terracotta tiles! And there were all the velvet and linen curtains, and macrame, and what not. As the trend changed, my parents redid some of the room, the hallway became a muted tribute to the 80's at one point, then the living room and master bedroom screamed 90's all the way, and my bedroom was the last to get rid of its retro vibe. 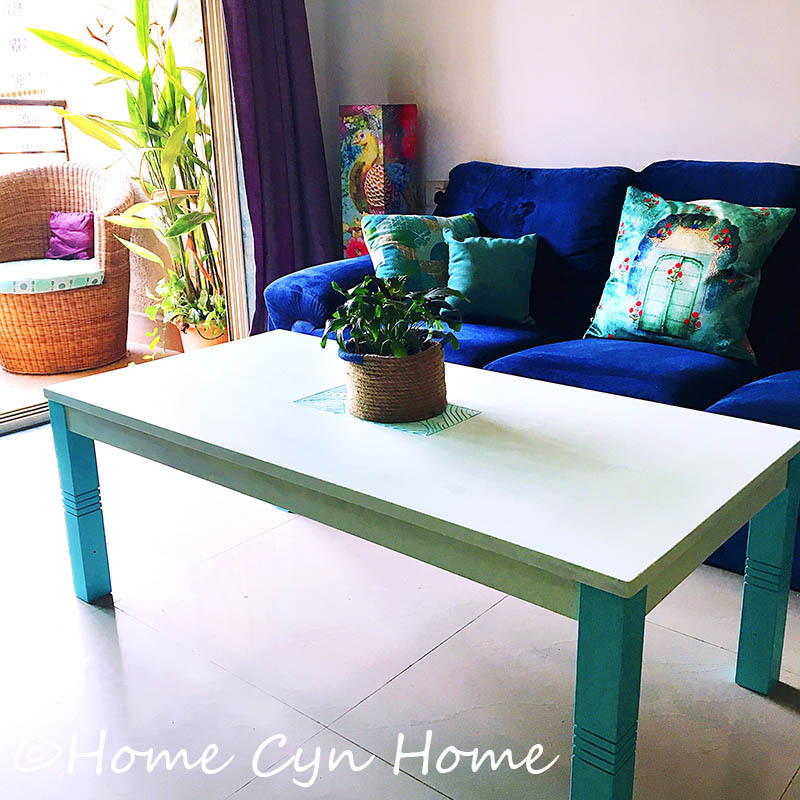 Even my own decor in 15+ years in India changed, we went from having very basic laminate furnitures, then bought dark wood furnitures for the living room, and right now we'd rather live in colorful furnitures, and accents, to the point of me painting the coffee table to match our style evolution. There is no telling what our home will look like 5-10 years from now, what we know is that we are never going to be the type to have built in furniture, even if we end up buying our own place. We love the flexibility of being able to change. And take it from a family that has lived in rental properties all the time, we also don't let that fact stop us, life is too short to postpone investing in nice furniture and decor items. Living decades in crappy rental decor to only save it for when we might live in a flat we own simply doesn't make sense to us. It's like delaying happiness and putting a condition on it, and it is never a good thing to do. Hi, how was your holi? Hope u had loads of fun. Home decor evoke mixed feelings. Some homes are over decorated and claustorphobic while others are so squeky clean that they become impersonal. I had an aunt whose house was so clean that every time i visited her, i was afraid of spilling something. I like your home clutter free home decor, interesting interplay of colours and functional furniture. I have a few ornate heavy furniture from my parents' marriage which are still going strong with a few repairs. The wood is incredible. I sometimes feel that they are members of my family. Queer feeling. I'm like you, I hate squeeky clean homes, I'm always scared to spill something or make a mess that will have the host giving me dirty stares. I also saw way too many homes both in my decorator career and here in India where the living room is overdone just to impress guests, and then the rest of the rooms are either plain, or totally messy and mismatched. The challenge with old wood furniture, is that they were build for a time when people had bigger homes, and they often make a tiny flat in a big city look crammed and claustophobic.